Everyone warns you: don’t make assumptions, because when you ASSUME, you look as foolish AS a SUM of Elephant seals, or however it goes. But assumptions are useful, as long as they’re based on facts! On the weekends, for example, I just assume, based on prior experience, that an NYC subway journey will take about twenty minutes longer than it’s supposed to because of crowds and construction. More often than not, I arrive about when I expect based on that assumption. Of course, if the transit authority magically got its act together, I’d have to update my beliefs—I wouldn’t let an old assumption about slow subways mislead me into showing up awkwardly early for things forever. It would probably only take two or three fast train journeys before I stopped building in that extra 20 minutes. My observations, in other words, would take precedence over my assumptions. But what if I couldn’t test my assumptions against the real world so effectively? What if I were working from very limited data? In the subway analogy, what if I had moved away from New York years ago, but I were still advising tourists about travel time based on how things used to be? My advice might be better than nothing, but still inadequate or misleading. By measuring the gravitational redshift of a star with a known radius we can also measure its mass, since for a typical stellar object (i.e., not a neutron star or black hole) the gravitational redshift depends only on those two quantities. We can measure the distance to Sirius B using its parallax very well since it’s so nearby, and by measuring its luminosity (based on its brightness and temperature) we can work out its radius. We can also measure its mass dynamically, by observing how it and Sirius A orbit around their common center of mass and applying Kepler’s laws of orbital motion, but there’s a small problem: estimates of Sirius B’s mass based on measurements of its gravitational redshift have historically differed from its dynamically-measured mass by about 10% (to be clear, this is from new measurements taken after the original ones were realized to be wrong). 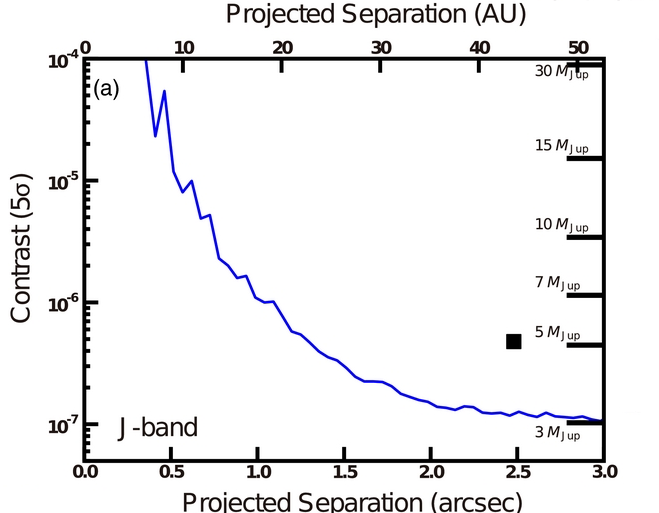 Direct imaging has turned up only a handful of planets. However, as observing sensitivities get better in the coming years, the technique will become a powerful probe of planet formation physics. Part of the reason planets are so challenging to image is that planets don’t carry out fusion themselves, so they just slowly cool and become dimmer with time. How, exactly, do they cool? We need to know this in order to convert the measured luminosity of a planet into meaningful data, like the planet’s mass. For that, we have to mostly rely on evolutionary models to predict the cooling curve. The authors of today’s paper do this by tackling the physics of the accretion process during its most rapid phase, when the growing protoplanet’s gravitational well consumes material as fast as the surrounding disk can supply it. What is going on in the disk around HD 142527? 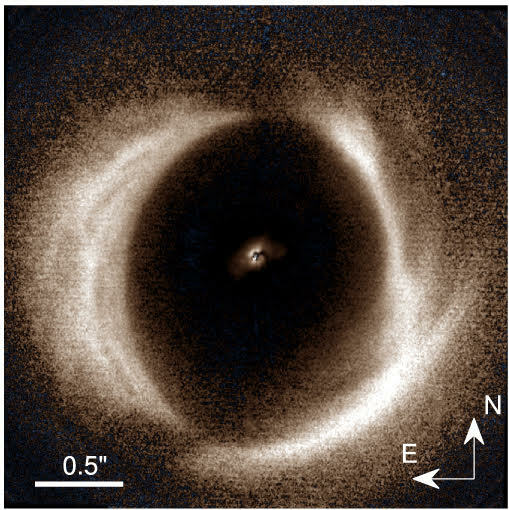 We are currently in a golden era of circumstellar disk imaging: new instruments like ALMA and SPHERE (both located in Chile) are gifting us with stunning images of systems surrounding nearby stars, with their glowing disks, neatly carved gaps, rings, and beautiful spiral arms (check this astrobite for a good review on protoplanetary disks). While most disks show only one or two of the aforementioned features, HD 142527 decided to make it big: the system around this 5-million-year-old star (Figure 1) is nothing short of spectacular. There are a lot of scary things out there in space: you know – like giant stars, black holes, aliens. But have you ever heard of a magnetar? On Earth’s surface, we experience a magnetic field less than 1 Gauss. The Sun’s magnetic field is not much more at about 25 Gauss. But a neutron star? Try a trillion Gauss. A magnetar is basically a neutron star on steroids with a magnetic field 1,000 times that of its normal counterpart. (You can read more about magnetars themselves in this astrobite). Magnetars can be formed in supernovae explosions, just like neutron stars (the details of what makes them so magnetic is up for debate). The authors of today’s paper are studying some strange supernovae, and they want to know if the observations can be explained by modeling those supernovae with a magnetar at the center instead of the ordinary neutron star. Neutron star mergers are absolutely fascinating. These events are not just sources of gravitational waves but of electromagnetic radiation all across the spectrum – and of neutrinos as well. If you missed the amazing multimessenger observations last year that gave us a peek into what binary neutron star (BNS) systems are up to, please check out this bite about GW170817! The observations had major implications for many fundamental questions in astrophysics. 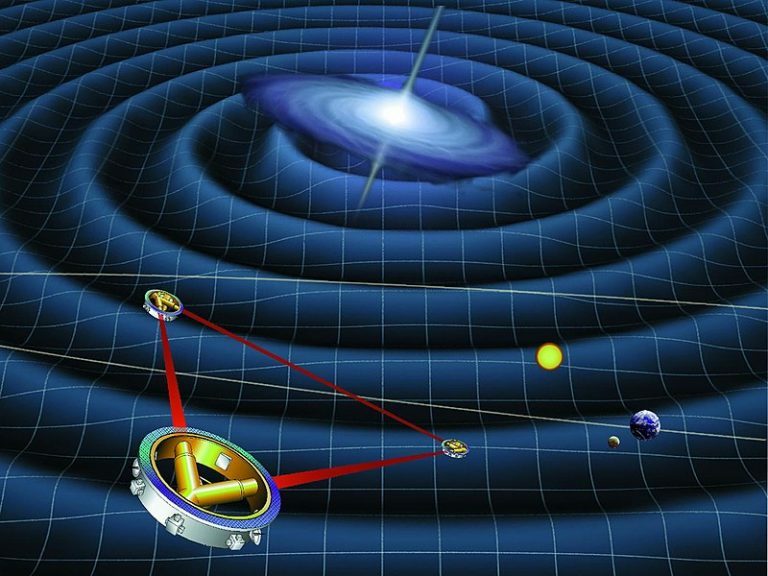 The gravitational wave signal from the merger was detected along with the electromagnetic radiation produced. As a result, we were able to confirm that neutron star mergers are a site where heavy elements (those beyond iron) can be made via the r-process. It’s a bird, it’s a planet, it’s a … speckle? The world’s state-of-the-art exoplanet imaging projects include the VLT’s SPHERE, Gemini’s GPI, Subaru’s SCExAO, Palomar’s Project 1640, and the LBT’s LEECH survey. As next-generation imagers come online, we need to think carefully about what the data say as sensitivities push closer in to the host stars. This Astrobite is the first of two which look at papers that change the way we think about exoplanet imaging data. Heading to Titan? Bring a Swiffer! Before the Cassini satellite began touring the Saturn system, very little was known about Titan (one of Saturn’s many moons). 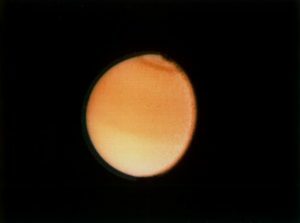 When Voyager flew past Titan in 1981 on its way out of the Solar System, it sent back an image of a brownish yellow ball of haze (see Figure 1). For the next 24 years we were left with the nagging question: What could possibly lurk on Titan’s surface, hidden from view by its thick atmosphere? By this point you have probably heard of Gaia, ESA’s amazing instrument that has cataloged over a billion stars, providing unprecedented precision in parallax measurements. Since its second data release in April, tons of discoveries have already been made (here and here and here). Several of these have been made by creating a simple HR diagram (HRD) of Gaia’s stars. When is the next glitch on pulsar J0537-6910? Pulsars (rotating, magnetised neutron stars) emit radiation that sweeps periodically over the earth (like the beam of a lighthouse sweeping across the ocean). We detect this radiation as a sequence of pulses, with the frequency of the pulse corresponding to the frequency of rotation of the star. Pulsars will typically spin down over their life time, due to electromagnetic braking, but this is a fairly slow process. Occasionally, in some pulsars, we will detect sudden increase in the frequency of the pulses. This is called a pulsar glitch. Essentially, the mismatch in the rotation of the fluid inside the star and the solid crust on the outside of the star causes a catastrophic event that we see as an increase in the frequency of the pulses. The Sun may be the closest star to us here on Earth, but there’s plenty about the Sun that we still don’t understand. One of the ongoing mysteries of the Sun, and really of stars in general, is their magnetic fields. Astronomers believe that the magnetic field of a star, which is invisible to the human eye, drives some of the stellar activity that we can observe. Starspots, like those seen on the Sun in Figure 1, are examples of such stellar activity. 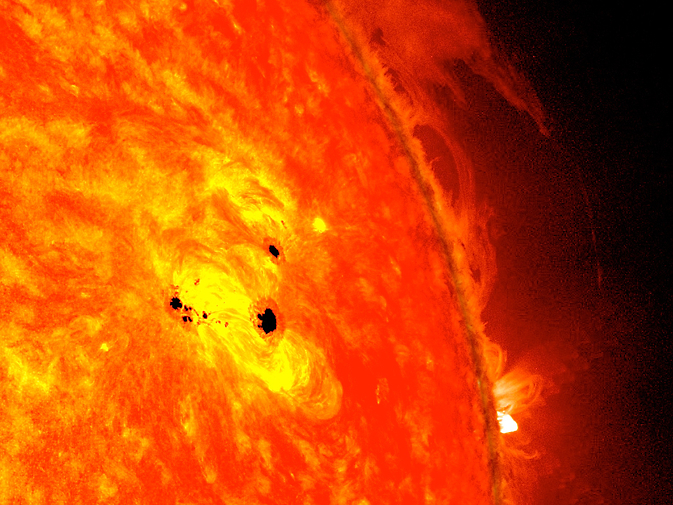 These dark spots appear in places where the star’s magnetic field is highly concentrated. On the 20th October, BepiColombo blasted off from Kourou on a five-year voyage to Mercury. BepiColombo is a joint mission between the European Space Agency (ESA) and the Japan Aerospace Exploration Agency (JAXA), which aims to explore the smallest and least-studied planet of the inner solar system. It’s made up of two science orbiters which will be carried to Mercury by a transfer module, harnessing solar electric propulsion and gravity assist flybys to place them into orbit around Mercury in 2025. BepiColombo will need to withstand pizza oven temperatures (up to 450°C/840°F), as well as battle against the Sun’s enormous gravitational pull in order to successfully orbit the Sun’s nearest neighbour. I don't think they'll ever catch him. Fourteen billion years ago, our universe came into existence, rapidly inflating for a fraction of a second and subsequently coasting outward. Around 380,000 years after this Big Bang, the universe cooled enough for photons to escape and our universe became transparent. Scientists call these early photons the “Cosmic Microwave Background” (CMB). The early days of the Solar System, like much of what happens in space, were indeed spooky. We know this because (a) there’s a Monster Mash verse about it and (b) like all great spooky scenes, they’ve left behind enduring mysteries.